Anderson's Maple Syrup will once again be partnered with DDP Motorsports to run the 2017 Pathfinder Chassis Super Late Model "House Car" for select races during the 2017 racing season. Dennis Prunty will once again be the primary driver. In 2016, the Pathfinder Chassis “House Car”, driven by Matt Kenseth, won the Slinger Nationals in Slinger, Wisconsin and then won the Dixieland 250 at WIR in Kaukauna, Wisconsin, with Dennis Prunty driving. Everyone at DDP Motorsports, Pathfinder Chassis and Anderson’s Pure Maple Syrup is looking forward to great 2017 season. Driving the Anderson's Pure Maple Syrup/DDP Motorsports #42, Dennis qualified 2nd. Track officials decided to do a "Total Invert" start for the fastest 16 of the 22 car field; Dennis now started 15th. Early in the race Dennis quickly worked his way up to the front with the leaders. While on the outside, he was going into turn four when a car ahead of him let up. Dennis could not react quick enough, bumped, and spun that car. By rule, he was sent to the back of the field, but again put on a passing clinic and quickly got himself back up to 2nd place. With only a few laps to go, a couple of cars tangled right behind Dennis going into turn one. Their wreck went right into the back of his car, sending him into the wall between turns one and two. The #42 suffered too much damage and couldn't finish the race. Driving the Anderson's Pure Maple Syrup / DDP Motorsports / Pathfinder Chassis House Car #42, Dennis finished 2nd in his qualifying race. Unfortunately, when the feature started, a left front spindle broke on the car. Dennis had to pit and didn't return to the race. Driving the Anderson's Pure Maple Syrup / DDP Motorsports #42, Dennis started the race on the outside of the front row. When the competition (10 minute) break came out with 93 laps to go, Dennis was in 4th. Shortly after the racing started up again, a couple of lead cars that were running directly ahead of Dennis made contact. Both cars crashed into the turn one wall, and while Dennis did everything he could to avoid the wreck, he ended up skidding into the wall right behind them. The #42 was too badly damaged to return to the race. Driving the Anderson's Pure Maple Syrup / DDP Motorsports #42, Dennis started the race on the outside of the front row. He was running up front with the leaders until on lap 65, going into the front stretch, a car in front of Dennis slowed up. With Dennis directly behind that car, he had nowhere to go and ran into the rear of that car, which then crashed, sending him to the rear of the field. Dennis was unable to get through traffic and finished the race deep in the field. Dennis took his Limited Late Model race car to Slinger to race in the season finale for Limited Late Models and won the 50 lap feature. Driving the Anderson's Pure Maple Syrup/Wiedmeyer Express #22, Dennis won his heat race and also won the 100 lap Super Late Model feature. This was Dennis' 49th Super Late Model victory. He also raced in the Limited Late Model Feature, driving #21 as a favor to a car owner/friend of his and also for the race fans. He took fast time and finished 2nd in that feature. Driving the Anderson's Pure Maple Syrup #42/Pathfinder Chasis-House Car, Dennis qualified 8th and finished 8th. Driving the Anderson's Pure Maple Syrup/Wiedmeyer Express #22, Dennis qualified 5th for race #3 in the Triple Crown Challenge Series. In a race that saw several battles for the lead, Dennis finished 2nd. With his strong finish and points totals from the previous two races earlier in the year, Dennis won the 2017 Triple Crown Challenge Series. Driving the Anderson's Pure Maple Syrup/DDP Motorsports #42, Dennis qualified 2nd. He was running good in the feature until on lap 29, another car, racing on the inside, made contact with Dennis going into turn one. Both cars skidded up the track, with Dennis hitting the wall in turn two. Dennis was not hurt in the incident but the car suffered some serious damage. Driving the Anderson's Pure Maple Syrup/DDP Motorsports/Pathfinder Chassis House Car #42, Dennis won heat race #2. He started the feature deep in the field and battled traffic throughout the entire race, finishing 14th. The race had a couple of red flag incidents and even a race track electrical transformer explode, sending sparks all over the spotters stand. Driving the Anderson's Pure Maple Syrup/DDP Motorsports/Wiedmeyer Express #22, Dennis had the quickest car in the final practice. He started 4th in the feature, took the lead on lap 22, and led the rest of the way, taking home another 1st place finish. Driving the Anderson's Pure Maple Syrup / DDP Motorsports #42 / Pathfinder Chassis House Car, Dennis was one of the quickest cars in practice; he qualified 8th and after the invert, started on the pole. For the majority of the race, Dennis ran up front with the leaders, when on the final lap, two cars spun ahead of him and Dennis spun to avoid them. The race officials did not penalize Dennis and put him back in his 5th spot. The race ended under a checkered flag / caution. Kyle Busch won the race but failed post race inspection, and as a result, Dennis was awarded 4th. Dennis took the Anderson's Pure Maple Syrup / DDP Motorsports #42 / Pathfinder Chassis-House Car to WIR to test it under racing conditions, to get it ready for next weeks ARCA Midwest Tour-Dixieland 250. The car was running great at the start of the race. Dennis was up in second place, right there with the leader when on lap 16, something went wrong. Dennis took the car into the pits and did not return, knowing the engine was blown. Driving the Anderson's Pure Maple Syrup/DDP Motorsports #42, Dennis qualified 9th and started 4th after the invert. In the early laps of the race, Dennis took the lead. While leading for several laps, he noticed the water temperature climbing, to at one point hitting 270 degrees. Trying to help cool the engine, Dennis slowed the car down, hoping to make it to the scheduled 10 minute break/pit stop. Unfortunately the car just shut off around lap 70. The DDP crew suspected that the ignition became too hot because of the over-heating. Dennis took the car to the pits and didn't return, finishing 18th. This DNF didn't stop Dennis and the DDP crew though - they went right over to Bubba Pollard's pit and helped the Pollard Motorsports crew work on Bubba's Anderson's Pure Maple Syrup #26. Driving the Anderson's Pure Maple Syrup/DDP Motorsports #42, Dennis started 16th and was running 6th with 43 laps to go. Then, with only 2 laps to go in the race, another car that Dennis was chasing lost control, slid, and checked up. Dennis had nowhere to go and made minor contact with that car. The race officials ruled that because of the contact, Dennis was sent to the rear of the field and ended up finishing 14th. Driving the Anderson's Pure Maple Syrup/DDP Motorsports #42, Dennis had a great night. He qualified 5th, took 1st place in the fast heat and completely dominated the 60 lap feature, taking 1st place. This was an extra sweet victory because after wrecking this car last week at the Rockford Speedway, the DDP crew worked all week to get the car fixed and ready to go for this race at Slinger. It was also a great opportunity to dial the car in for the upcoming Slinger Nationals on Tuesday, July 18th. Driving the #22 Anderson's/DDP Motorsports/Wiedmeyer Express car, Dennis finished 2nd in the feature after starting 10th. He was gradually closing in on the leader but there just wasn't enough laps left in the race to make a run for the lead. On lap 34, Dennis and another car made contact in turn 1, bringing out a caution. By rule, both cars were sent to the back of the field. Dennis did a great job of driving, working his way back up to 7th. On Lap 73, coming out of turn 2, Dennis went a little too high and scraped the wall going down the backstretch. The car suffered too much damage for him to be able to return to the race. Driving the #22 Anderson's/DDP Motorsports/Wiedmeyer Express car, Dennis finished 4th in the feature. Not a bad finish for him, seeing that he raced the night before at the Gateway Motorsports Park near St. Louis, MO. Driving the Anderson's/DDP Motorsports #42, Dennis started the race in 4th position. The car ran well until it picked up a vibration with about 6 Laps to go. Dennis had to pit but was still able to return to the race and finished 10th, on the lead lap. It was a great race for Dennis, considering that this was his first time ever at this 1.25 mile track. Driving the #22 Anderson's/DDP Motorsports/Wiedmeyer Express car, Dennis started the race in 3rd position. Within just a few Laps, Dennis took the lead and led the field to the finish, taking home his second win of 2017. Dennis was pretty tired at the end of the race, having also raced earlier in the day in the ARCA Midwest Tour 100 at the Marshfield Speedway in Marshfield, WI. Driving the #42 Anderson's/Pathfinder "House Car", Dennis started the race in 10th position. The race ran caution free for the entire 100 Laps, with Dennis finishing 10th. This race was originally scheduled for Saturday night but was re-scheduled to Sunday afternoon due to a power outage at the track. Sunday's race was also delayed for about two hours because of some very strong storms that moved through the area. Driving the #22 Anderson's/DDP Motorsports/Wiedmeyer Express car, Dennis started the race in 6th position. Within a short time, Dennis and the rest of the lead cars started dealing with lapped traffic. Dennis was able to get up to 3rd position and held that spot to the finish. Driving the #42 Anderson's/Pathfinder "House Car", Dennis started the race in 15th position. He avoided a wreck that occurred ahead of him on the first lap of the race. On the re-start of lap #1, Dennis started in 13th. He battled with traffic for the entire race and finished in 10th. 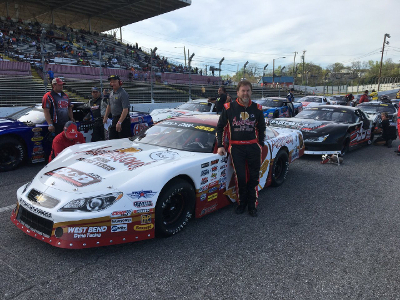 Dennis qualified 3rd, driving his Anderson's/DDP Motorsports #42 for this event. The car was absolutely dialed in and Dennis was able to take the lead in the race within about the first 15 laps. Dennis was unstoppable, leading most of the Laps and finishing the race in 1st place. Dennis started the race in 13th position. The Anderson's/Pathfinder-House Car/DDP Motorsports #42 appeared to be running great with Dennis being able to work his way towards the front, getting up into 5th position within about the first 50 laps. Unfortunately the car suffered another mechanical issue with about 10 Laps to go and Dennis had to pull the car off the track. Dennis started the race in the 21st position. Although the race track itself remained in good condition, the race was run under steady misty weather conditions. There were several wrecks during the race and Dennis was able to avoid them all. 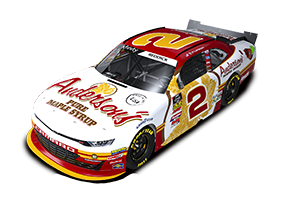 The Anderson's Pure Maple Syrup, DDP Motorsports #42 finished the race in 14th position. The Anderson's Pure Maple Syrup/DDP Motorsports/Pathfinder Chassis "House Car" #42 driven by Dennis Prunty qualified 17th. Dennis was able to work his way up to 3rd place in the race. On a re-start, following a caution around lap 97, the car had mechanical problems and would not get up to speed. Dennis pulled into the pits and the crew thought they fixed it. Dennis attempted to return to the race in time to remain on the lead lap but the car would still not get up to speed. Dennis again went into the pits and did not return to the race. The Anderson's Pure Maple Syrup/DDP Motorsports/Pathfinder Chassis #42 driven by Dennis Prunty qualified 17th. The race had some of the best Super Late Model drivers in the country there. Dennis ran well and finished 8th, on the lead lap.